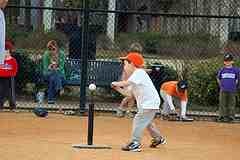 T-Ball: How to start baseball players on the right foot. T-ball aged kids (5 & 6 year olds) basically just want to play. You know—the kind of ‘playing’ that kids do. They play in the dirt with toy shovels, cars and trucks. They play ‘tag’ or ‘chase’ games on the playground or in the backyard. Usually competitive games are not a big deal to t-ball age kids. Their minds and bodies are not inclined to keep score yet. They just enjoy playing. Yet, we put team colored shirts on them, put them on organized teams with names on their backs, and push them into competition whether they like it or not—or if they can even catch or throw the ball. We baseball parents line our folding chairs up on both foul lines, keep our stat books and start the whooping, cheering and hollering on every single play like it’s the World Series. 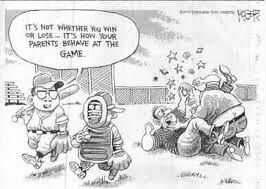 As baseball parents, we start gauging our parental abilities to the performances of our kids. If our little Johnny gets on base or comes around to score then we as parents must be doing a good job raising them. We slowly start measuring our parenting skills and see ourselves as a good family based on the performances of our kids. Not a good behavior to get into. One of the problems with tee ball is the coaches do not have much if any training on how to properly coach a t-ball team. Practices and games end up being very slow moving. Know how to organize baseball practice. Understand how to group players with coaches. Realize how to maximize batting practice swings. Comprehend the safety issues and implement procedures to keep players safe. Know what baseball equipment is needed to maximize player development and improve safety. Know ways to minimize kids that are off-task (picking flowers and watching airplanes). For all your practice plan templates, batting practice organization and safety procedures look at the player development resources here. Games: Here are some vital points to ask yourself when conducting tee ball games with the players player development system in mind. Are we playing 3 outs and switch sides or are we batting through the order and then switching? Are we rotating positions regularly? Are we stopping the games to instruct one player at a time? Are there any game strategies like bunting and stealing going on? Do you clearly understand where the batting tee should be placed in relation to the batter and home plate? Is there any coaching from the bleachers going on? What type of pre-game baseball practice routine are you using? Do you know what this one tip could do to improve the chances of your ball players becoming a college and pro prospect? Do you know the biggest secret to helping your kids improve their baseball skills? For all the correct responses to these topics please refer to my player development resources and help your ball players get off to a great start in baseball. Keep the games low key. Crowds should be passive, supportive and encouraging. There is no reason to be squealing, cheering and screaming at kids who are just out ‘playing’. Increase every kid’s opportunity to develop skills. Get this wrong and we might lose the kids and the families forever.